The recipe I tried out for you this month was a delicious fruit salad with banana dressing. It was so good! The flavors are very fruity, and the dressing is a creamy but not super heavy, compliment. It does have banana flavor, but I didn’t feel like it was so strong that it took over. The sour cream gives the dressing the creaminess and tones down the sweetness of the brown sugar, and the lemon juice gives it a little pop as well as seemed to keep the banana dressing from turning brown. I do recommend that you give the dressing the two hours of setting so the flavors get all mingled. The whole salad can be prepared ahead of time and allowed to rest, tightly covered in the refrigerator. Although the recipe calls for cantaloupe and honeydew, I think the dressing would be great on watermelon, with apples and grapes as well, though you would lose part of the Hawaiian twist! If you really want to take this salad further, serve it with some grilled pound cake or some old fashioned coconut cake. These combinations of fruits could be great in a parfait or trifle as well and would be beautiful. This recipe is gluten free (as always check your ingredients) and is great for cutting calories. If you have diet friendly guests it is very simple to serve the dressing on the side, allowing them to dip the fork in the dressing instead of loading up. This recipe would be great for potlucks and brunches, it is really perfect for any time! Be cautious of cutting fruit several days in advance, as very ripe fruit will ferment faster when exposed to the air (most concern would be with the pineapple and melon). A delightful Hawaiian Fruit Salad with a deliciously light and creamy dressing to add a little something extra. Combine dressing ingredients in blender, and blend until smooth 15-20 seconds. Refrigerate 2 hours. Combine all cut fruits in a large bowl and toss together gently. Mound fruit on individual, lettuce lined plates. 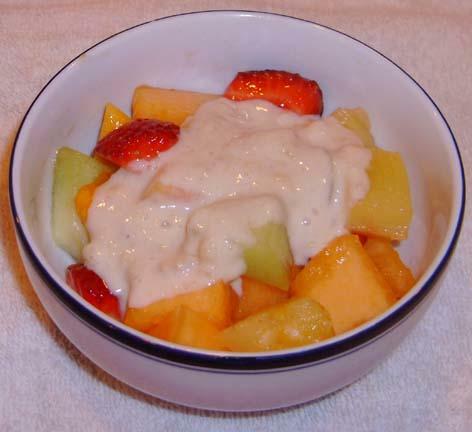 Serve Banana Dressing in a gravy boat, or pour dressing over individual fruit salads.